Are 3 John Cenas performing spoken-word poetry about vodka, or are we high? “Hey-look-at-this-isn’t-this-weird-now-buy-our-thing” ads are nothing new. We’ve covered quite a few of them. But even by the standards of, say, the Jack In The Box mascot doing a Reddit AMA, this John Cena-starring SKYY Vodka ad is pretty freakin’ strange. 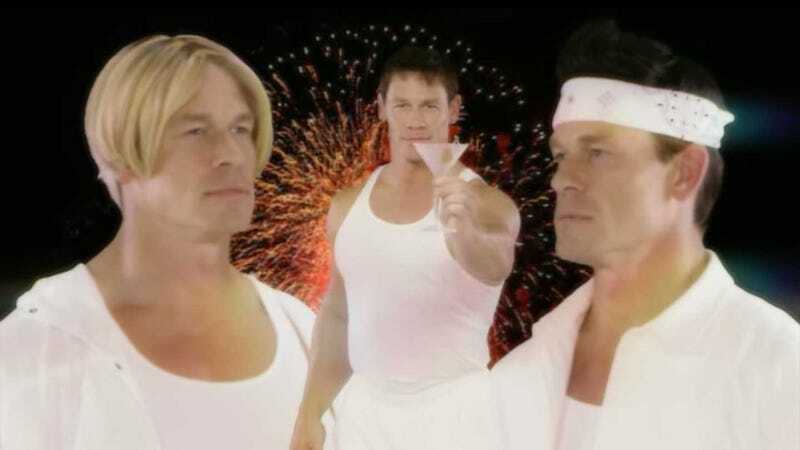 John Cena is in a boy band. So are two other John Cenas, from other earths or timelines. (Take your pick.) There’s John “Nick Carter” Cena, and John “A.J. McLean or maybe Justin Timberlake or maybe Chris Kirkpatrick” John Cena, and then there’s just John “John Cena” Cena. They are obviously in a Backstreet Boys-style video, but are not singing. Instead they are speaking, and the... poem?—let’s call it a poem—the poem they are reciting seems to be about a girl, but is actually about a vodka, and also about America? We think? Does... Does John Cena want to make it with a bottle of SKYY Vodka? So, ah, SKYY Vodka would like you to buy it, please. Have a nice weekend. Wait, you can distill vodka from honey? Contributor, The A.V. Club and The Takeout. Allison loves television, bourbon, and dramatically overanalyzing social interactions. Which powdered food makes the best popcorn seasoning?